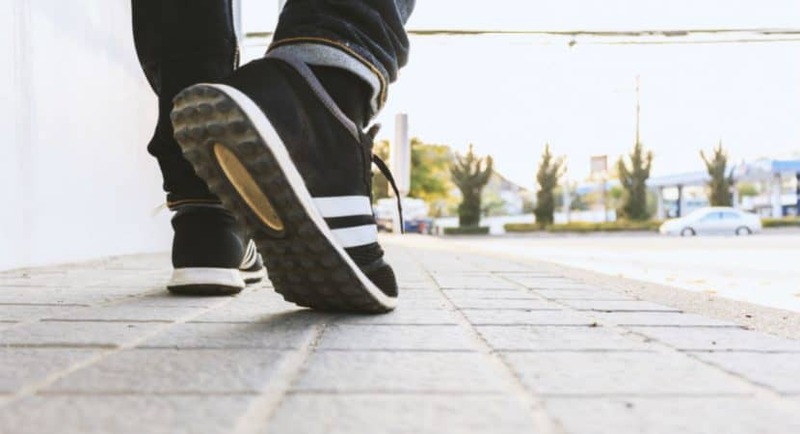 Finding an everyday pair of walking shoes that is both comfortable and practical can often be a more daunting task than initially anticipated due to the number of options currently available on the market. Buyers are tasked with comparing a whole host of factors such as comfort, waterproofing, and ankle support in their search for the best walking shoes for men. In order to help narrow down the vast array of walking shoes you have to choose from, we’ve compiled a list of five shoes with unique key features to appeal to a broader audience. The MW577 has been included in our top five as New Balance is an extremely reputable brand in the footwear industry. As claimed, this is a durable pair of walking shoes that can be fastened quickly. The MW577 is a great pair of walking shoes, thanks to its leather construction which not only increases its durability but also drastically adds to its waterproofing capability. 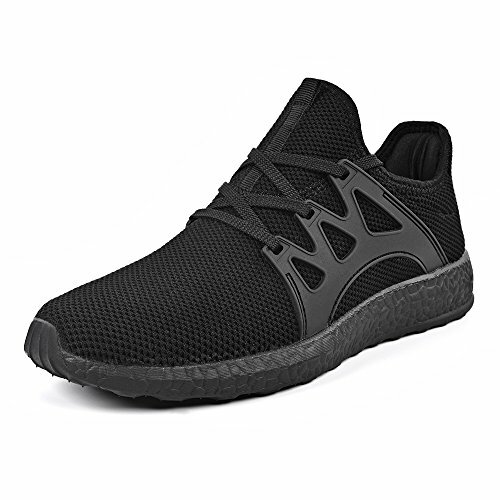 Buyers will also benefit from the polyurethane midsole cushioning as well as from the foam-padded collar and tongue since these don’t simply add comfort but also create a snugger fit, securing the shoes in place. The most notable feature of the MW577 will be its extremely easy and quick-fastening dual-hook and loop system. 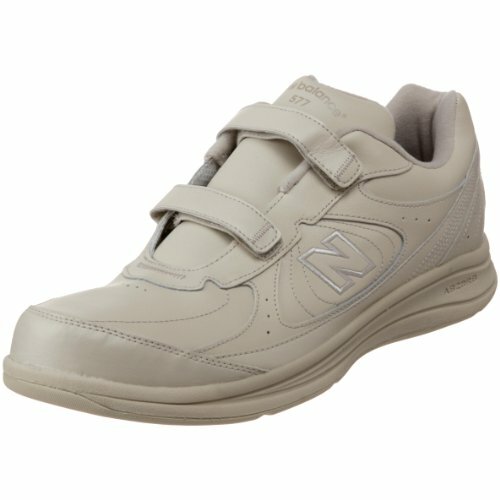 As such, the shoes are incredibly accessible, making them great for all age groups as well as for people who may suffer from mobility issues and have problems with wearing laced shoes. Additionally, with the shoes having a low-top from the arch, a bit more ankle support is provided without becoming too restrictive. Such a design also allows the users to freely rotate their ankle without the difficulty often experienced in hiking boots. The rubber sole also increases the life of the shoes since it enables the shoes to put up with a lot of wear and tear while still being fully functional. Available in a few colors, the MW577 is excellent for a variety of occasions whether you’re visiting the supermarket or in need of a comfortable pair of working shoes. Construction: The durability derived from the construction of these shoes makes it an incredibly long-lasting product as compared to others in the same category. Manufactured in the USA: New Balance is one of the few athletic footwear companies still manufacturing in the USA, and they’re also an extremely well-known brand, so you can rest assured that you’re buying from a quality producer. Snug fit: Despite not having laces, you get an extremely good fit, thanks to the type and location of the padding used. Weatherproof: Having a pair of shoes made of leather makes it a great all-weather product as opposed to the shoes that are more lightweight that don’t offer anywhere near as much protection from the climate. Unique heel technology: The ABZORB technology in the heel of the shoes makes them extremely comfortable for walking and will also help reduce the impact on your joints. Design: The design of the shoes itself isn’t the most appealing, and it’s only available in three different colors. Not very convenient to wear: While the hook-and-loop fastening system is faster than laced shoes, it is still not as convenient as a slip-on. Weight: Due to the leather construction, it is a relatively heavy pair of shoes, which could become noticeable after walking for longer periods of time. 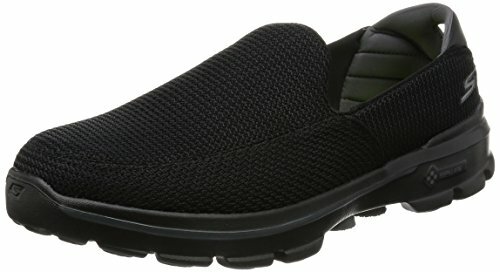 Skechers is known for producing fantastic shoes that combine both functionality and style, and the Go Walk 3 is no exception since it is breathable and stylish and still has a solid construction. Utilizing a predominantly mesh construction, the Go Walk 3 is incredibly lightweight and breathable, allowing the user to walk for prolonged periods of time without feeling like the shoes are starting to weigh them down or beginning to overheat. With a Goga Pillars sole and Goga mat insole, users benefit from great rebound cushioning which will help lessen joint impact and allow for a faster walking pace. These shoes also use memory foam padding around the heel that helps provide a secure but incredibly comfortable and custom fit. The Go Walk 3 has a 1.5″ heel for added support when walking over uneven terrain. It can also provide a generally comfier step. At the top of the heel, users will notice a pull tab that allows the user to put the shoes on with ease. The most prominent feature of this pair of shoes is its slip-on design since a slip-on shoe provides the ultimate convenience as users can put it on in a fraction of the time when compared to laced or hook-and-loop shoes. Hence, users who suffer from any form of lower back pain will love these shoes as they’ll be able to spend less time bending over to put the shoes on. Ease of use: The ease of wearing the shoes makes it a great pair of shoes whether you’re going for a long walk or just popping into the backyard. Suited for warm climates: The loafer design combined with the mesh construction makes them incredibly lightweight as well as breathable, this makes them the perfect walking shoes for warmer climates. Comfortable level: Using a variety of Goga cushioning and memory foam padding, the shoes is considered one of the most comfortable walking shoes available. You’ll also find walking for longer periods of time a lot more bearable. Great traction: The grip on the bottom of the shoes offers great traction for rough or slippery terrains. Multiple color choices: Coming in a variety of colors, the Go Walk 3 can be a great casual pair of shoes. Low level of water resistance: The mesh construction doesn’t lend itself particularly well to higher levels of water resistance. Little-to-no ankle support: There is insufficient ankle support, so it offers less protection from sprains if you were to slip. Thin soles: The sole is relatively thin when compared to shoes of the same level. This might not be as comfortable for the user as they’re more likely to feel uneven footing, such as stones, through the sole. We’ve included the Mxson Mesh Walking Shoes in our top five list as it offers many sought-after features such as breathability, improved ankle support, and a more sports-focused style. The first feature that buyers will notice is that the vast majority of their shoes are made of mesh materials. This is how Mxson is able to deliver such an incredibly lightweight pair of shoes that offer better breathability than most of its sport shoe counterparts. Having this sports style has also led to the Mxson’s raised back, sides, and collar support, which will increase the user’s ankle stability. Combine this with the textured sole, which is elastic that allows it to expand upon contact with the ground for greater stability, and you have a pair of shoes that can easily handle a wide variety of terrain from roads to hiking trails. Utilizing a relatively thick heel, users will benefit from a better level of cushioning, letting them walk for longer periods of time with little impact on their ankle or knee joints. This support also continues through to the midsole that helps support each individual step. The Mxson also has a slip-on design that allows the users to slide their feet into the shoes significantly faster than those with laced or hook-and-loop designs. This is great for those who are always in a rush and are looking for shoes that offer not only fantastic support but also convenience. Great ankle support: The added ankle support lets users feel that little bit more confident in their foot placements when on uneven terrain. Breathable and lightweight: Having a mesh construction really boosts breathability as well as reducing the overall weight of the shoes, making walking more enjoyable especially over longer distances. Ease of use: Slip-on shoes offer unparalleled convenience, and the Mxson has taken advantage of this combining it with its mesh construction for a fit that stretches with each step. Multiple color choices: There are a huge variety of color options to choose from, letting you select walking shoes that are not only practical but also suit your sense of style. Elastic soles: It has an elasticated sole that adapts with each step. Maintains its shape: The minimalist frame running along the side of the shoes helps add support so that the shoes keep their shape while also staying lightweight. Low level of water resistance: Using a mesh material as opposed to leather won’t provide the same level of protection against the weather. Insufficient padding: There isn’t as much padding around the ankle as some other shoes in the same price bracket. Lacks a pull tab: With no pull tab on the back of the shoes, the Mxson isn’t as easy to remove as other shoes in the same category. Rockport is known for offering extremely high-quality footwear that is built to last. The Eureka is an excellent pair of walking shoes providing some of the best heel support; thanks to its San Crispino construction. The most noticeable feature of the Rockport Eureka is its leather construction. Not only does this high-quality finish increase its water resistance but also drastically improves its durability, leaving buyers with shoes that they can wear for a long time. With the sole made of a synthetic material, it has both shock absorbent and stability-enhancing properties. Rockport have also made sure to sufficiently pad both the collar and the tongue to not only help add some ankle support but also increase comfort while adequately securing your foot in the correct position. The Eureka pair is our first lace-up shoes on the list which may forfeit the convenience seen with that slip-on or hook-and-loop pairs but does benefit from a tighter and more secure fit. Thus, this pair is great for regular walkers since slip-on shoes are likely to become looser over time and hook-and-loop fasteners often can’t be replaced. Laced shoes don’t suffer from those blights as laces are easily replaced, and the structure of the shoes helps them to maintain their shape. With a latex foam footbed and EVA midsole, there is a great deal of shock absorption offered by this pair of shoes, making it easier for buyers to walk longer without as much impact on their joints or feet. Also, with an outer sole made of rubber, the shoes’ durability is enhanced as well as extremely tear resistant. Sufficient ankle support: Firstly, the level of ankle support found with the Eureka is fantastic and the shoes feel a lot more secure on your foot than their counterparts. High-quality construction: If you’re looking for a well-made pair of walking shoes, you’ll be hard pressed to find a better one. The leather construction combined with its hard-wearing stitchwork and robust synthetic sole creates an incredibly long-lasting shoe. Breathable: Another great feature of the Rockport Eureka is its moisture-wicking material that helps regulate your body temperature and stop your shoes from feeling sticky or sweaty after walking for long periods of time. It’s inner mesh lining also helps to increase its breathability through increased airflow. Versatile design: The design and style of these shoes make it a great option for work or formal wear. Limited color options: You’re limited to just three color choices. Weight: Due to its sturdy construction, it is a relatively heavy shoe, and this could become quite noticeable and tiring after walking for prolonged periods of time. The Brooks Addiction is a professionally produced shoes that deliver on quality and comfort to allow buyers to walk for longer periods of time without any discomfort. The first feature that most buyers will notice is the deep heel of the Brooks Addiction. This provides a significant level of shock absorption, making you feel a minuscule amount of pressure when compared to similar shoes. Also, since a combination of leather and high endurance rubber is utilized, these walking shoes will fare well in all weather conditions with little signs of wear throughout the years. Additionally, as being made of leather, they’re less prone to stains or scuffing. With a lace-up style, the shoes have an extremely secure and stable fit, especially since lace-up shoes don’t lose their shape as quickly as slip-on shoes. Similarly, with both a padded high collar and tongue, the Addiction offers a good level of ankle support to keep you feeling secure on your walks. The inner cloth lining also helps increase the breathability of the shoes and stop your feet from feeling uncomfortably warm. Material choice: Being made from durable yet functional materials, the shoes will keep you from having to buy shoes on a regular basis as you can expect the Brooks Addiction to last longer than its mesh counterparts. Shock absorbent: The high level of shock absorbance is incredibly useful for people who already suffer from foot or joint pain as well as creating a generally more comfortable walk. Weight: Coming in at 14 ounces, the Brooks Addiction is surprisingly lightweight especially when you compare it to other leather walking shoes. Lace design: Laced shoes feel significantly more secure than over fastening methods which is a key variable when looking for everyday walking shoes. Unappealing design: The Brooks Addiction isn’t the most visually appealing shoes and is limited to only three colors: black, white, and suede, which would be more prone to staining and scuffs. Price: These shoes are relatively expensive when you compare them to others offering similar features at the same level. Collar height: The sides of the collar dip quite low; if they were slightly higher, they would feel even more secure than they do already. A good pair of walking shoes is an incredibly worthwhile investment especially if you’re looking for one that can put up with everyday use. The only problem is that there is such a wide variety of walking shoes available, and it can be challenging to find a pair that offers all the features you’re after. Before all else, it’s essential to determine the intended use of the walking shoes, whether they will be an everyday walking shoe, a shoe for work, a hiking-specific shoe, etc. This will help you pinpoint the right features for you. That said, this buyer’s guide will take you through some of the most prominent features that you should keep an eye out for when buying your walking shoes. The style of the shoes is a huge factor when considering whether or not it is the right pair of shoes for you. The style includes the shape, arch size, heel depth, and fastening method, and these are all aspects that can be noticed on your initial inspection of the shoes. The fastening method of the shoes will determine not only the overall convenience of the shoes but also their general shape and size. Slip-on shoes are generally the lightest and most compact shoes but often sacrifice heel depth and require cushioning. Hook-and-loop and laced shoes are often larger in size but typically offer greater support as well as comfort due to the greater heel depth and insole depth. Flexibility and support are crucial factors to consider when looking to buy a pair of walking shoes for heavy use. When we talk about shoe flexibility, we refer to the magnitude in which the shoes is able to twist and turn with your foot. A more flexible shoe will move with the direction and applied pressure on your feet whereas a stiffer shoe will feel clunky and more like, uncomfortable. Support commonly refers to the amount of padding in the collar as well as its height. The collar is the opening to the shoe and the higher the collar, the higher the level of ankle support. The only problem with having a collar that’s too high is that it can limit the mobility of your foot. It also isn’t often practical unless you’re traveling across extremely uneven terrain such as mountains. Walking shoes need to be comfortable, especially if you plan on using them over prolonged periods of time. This is relatively hard to gauge without getting your hands on the shoes themselves, so at any opportunity, head down to your local store and get a feel of the shoes before any purchase. The cushioning is often depicted by the collar, midsole, and tongue padding. Midsole padding isn’t simply for comfort but also for shock absorption to help reduce the impact on your joints. Tongue and collar padding also serve to help secure your foot in the shoe, so the more padding, the snugger the fit. Everyday walking shoes will see a variety of different weather conditions whether it be rain, snow, or sunshine. Therefore, it’s important to get a pair of shoes that can deal with the changing climate. Shoes with a higher level of water resistance are a huge plus and will serve you all year around. Ideally, you’ll want to look for shoes made of leather or worst case, synthetic material. While mesh shoes are great for their breathability and reduced weight, they typically won’t fair well when the weather takes a turn for the worst and rain starts to pour. Walking around with wet feet is an extremely unpleasant and uncomfortable experience, so make sure to check the shoes’ construction material. If you’re just looking for a casual shoe that provides adequate support but doesn’t become cumbersome too quickly, then mesh shoes will be a better choice for you. They’re significantly lighter and produce better airflow than their leather shoe counterparts. On the contrary, the benefit that leather shoes have over mesh is that they’re extremely durable, typically waterproof, and often more comfortable over longer periods of time. The downside is that they are generally heavier, meaning, they’re not great for too many activities such as running or hiking. You could easily spend hundreds of dollars on a pair of shoes, and it might never be as comfortable as a $30-pair if you don’t get the right fit. All shoes fit differently due to their padding, shape, and style, so use the size as more of a guide than a guarantee. When finding the right fit, you’ll need to know your foot size, the size of your arches, and the width of your foot. These three factors will help you find the perfect fit for you. Most stores will help measure your feet and provide you with a variety of options that will deliver the greatest level of comfort. 1. How often to replace walking shoes? The frequency at which you replace walking shoes is solely dependent upon the quality of the shoe as well as its intended use. If you plan on using a shoe every day in harsh working conditions, you’ll likely need to replace them significantly more often than someone simply wearing them for a casual walk on the weekends. This also goes for the quality of your purchase. Buying a poorly manufactured shoe will likely result in more replacements than if you had originally purchased a better-quality shoe, to begin with. That being said, it is typically a good idea to replace shoes when they no longer serve their intended purpose. This could range from no longer being waterproof or a completely worn-down tread. 2. How long do walking shoes last? Again, this is completely dependent on the quality of the shoes but typically, if you buy a good pair of shoes that are regularly used but not every day, then you should expect to get a good couple of years out of them. The construction material of the shoes also plays the largest role in how long a walking shoe lasts. Leather shoes are generally more durable and can take more abuse than those made of a mesh material. 3. 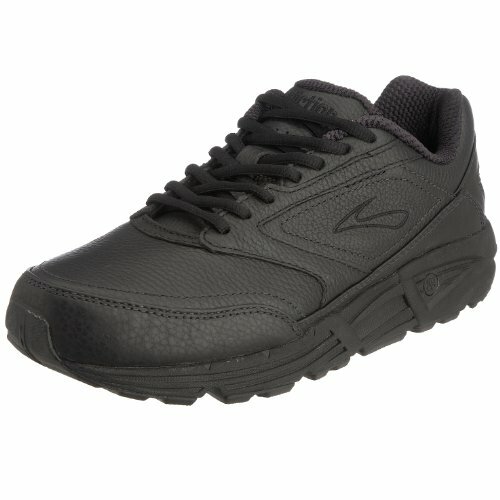 How to choose walking shoes? The best way to choose a good pair of walking shoes is to get down to your local store and try on as many different shoe styles as you can, as this will help you gain a better picture of the type of shoes that are best for you. Once you have a good idea of what you’re after, you can then have a look online and find a shoe that seems right for you, but again, we’d advise that it would be better to find a store that stocks the shoe so that you can try it on before purchase. 4. What is a good walking shoe? A good walking shoe is simply comfortable but should also provide adequate support and flexibility for the wearer. It’s also best to buy a shoe made from sturdy and durable materials that are able to cope with a variety of climates and terrains. You also want a walking shoe with an appropriately sized heel depth, as this is where most of the shock absorption comes from. Greater shock absorption will typically lead to longer walking times before any joints start to ache. 5. What is the difference between walking and running shoes? Running shoes are designed for more serious impact with the ground and a heel-to-toe motion. This typically results in a relatively thick heel with convex tread to allow an easier flow of movement. On the other hand, walking shoes are designed to serve more general functions rather than one specific task, which leads to compromises across different shoe features. The style of walking shoes is also hugely different in order to make them wearable on a variety of occasions, allowing the user to get the most out of them. Now that you’ve read our review of some of the best walking shoes for men currently available on the market, you should have a better understanding of what features are best suited for your needs. 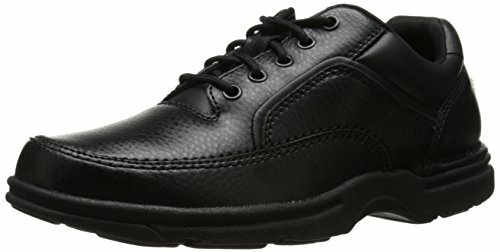 Our recommendation for the best walking shoes would be the Rockport Eureka. Not only does this pair provide a good level of support and flexibility, but it is also extremely comfortable due to its high levels of padding and moisture-wicking material. It’s also very durable and provides a snug and secure fit. However, if you are a bit more budget conscious but still wants a great pair of walking shoes, then the Mxson Mesh Walking Shoes would be a great choice for you. Not only does it provide a good level of ankle support, but it is also incredibly lightweight and breathable.